What are the best shows in town? It is something we get asked all the time. Of course we have our favourites, but this year we decided to turn the tables and ask you what you thought were the best shows that you have seen already and what shows you think you might like to see. Respondents from all over the UK took part in a survey to find out what shows people have most enjoyed and what shows people think they would enjoy seeing next. The really great news for anyone who has not come to town yet to see a show is that all but one of the top ten shows are still on in London. Top of the pile is stage and screen spectacular Les Misérables by Alain Boublil and Claude-Michel Schönberg – who appear twice in the top ten with Miss Saigon coming in at 7. Home grown tune-smith Andrew Lloyd Webber manages to do the same with The Phantom of the Opera (3) and Cats (10) but his one time pal and writing partner, Tim Rice, pips him at the post claiming second place thanks to his involvement with Disney’s The Lion King. Broadway productions Wicked (4) and Jersey Boys (5) shade out the other British offerings in the top 10: We Will Rock You (6), Mamma Mia! (8) And Billy Elliot (9). 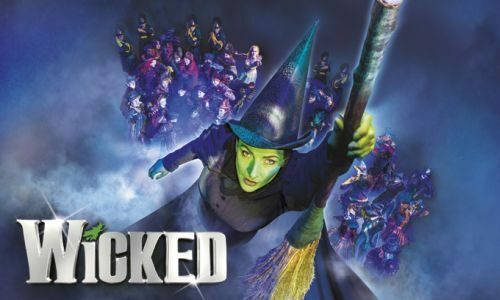 The most aspirational show to see is Wicked. 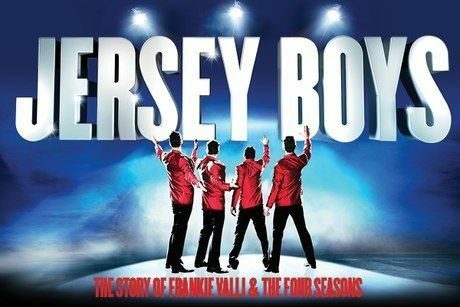 In fact the top three are all from Broadway, with Disney’s The Lion King and Jersey Boys completing the medal line-up. 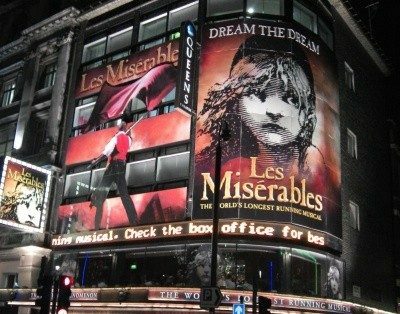 The return of Miss Saigon into London’s Prince Edward Theatre helps that to fourth and even after all this time Les Misérables still commands 5th spot, helped in part by the hugely successful film adaptation starring Hugh Jackman, Anne Hathaway and Russell Crowe. Three relative new-comers follow: Roald Dahl’s family-friendly Charlie and the Chocolate Factory and Matilda followed by the far-from-family-friendly The Book of Mormon! Disappointingly but maybe not surprisingly no plays feature in the top 10 of favourite shows – probably more a comment on the size of audience they can command, appearing, as they often do in smaller theatres and for shorter runs. But maybe it is of no surprise that when it comes to listing shows that UK theatregoers would like to see next, Michael Morpogo’s War Horse comes in at number 9. New opening at the London Palladium, Cats completes the table. Family friendly musicals enjoy a strong showing in the list, with all West End family favourite regulars appearing in the top 10 showing that “going to the theatre” is considered very strongly a “family” thing to do. The list taken as a whole underlines the breadth of UK theatre with 245 different shows being cited amongst the nations favourites – this is especially encouraging when respondents, whilst all having been to the theatre, are not necessarily regular theatregoers. That being said, throughout the responses regional theatrical productions is woefully under-represented as is our nation’s favourite son: William Shakespeare. But with the appearance of Queen epic We Will Rock You and Mamma Mia! based on the hits of ABBA it is clear people are voting with their hearts and I firmly believe theatre connects with our hearts before it connects with our minds! What show would you most like to see next? Who do you go to the theatre with? Respondents were allowed to chose as many options as they liked. Drilling down into the information, when it came to taking family members other than partners, female relations were 6 times more likely to accompany theatre-goers than male relations. * 70 people didn’t mind what they saw next!